Winnebago County is blessed by many men and women who have dedicated their lives by serving in our Armed Forces. These men and women who sacrificed so much are recognized and honored all year in our county at different events. Some of these events have been recorded in the local newspapers for generations. One article written in the Rockford Morning Star paper in February of 1930 spoke of three men with the label “The Boys of ‘76”. These men all served in the Revolutionary War and moved to Winnebago County later in their lives. Jehial Harmon was born in Suffield, Connecticut, Oct. 5, 1762. He was only twelve years old in April of 1775 when the Battle of Lexington occurred. Though Jehial expressed his desire to go to war and fight with his older brother, his parents thought he was too young. They finally relented in 1779, when Jehial turned sixteen. His brother was ill and was forced to leave the service. Jehial stepped up to replace his brother and from all accounts fought bravely. He survived the war and married Betsy West. Jehial moved to Rockford in 1844 when some of his children came to the “west” to settle and start families of their own. Jehial died here in Rockford on March 3, 1845 and was buried at Greenwood Cemetery. Samuel Campbell, another of the Boys of ‘76, is buried in the Hulse Cemetery near Pecatonica. He was born in Massachusetts in 1762. Samuel served just over three months in the war but was highly thought of by his commander. He married Grace Plum in 1793. The couple had ten children and decided to move to Illinois, choosing Winnebago County. Samuel passed away on November 8, 1844. The third man, Ephriam Palmer had a military career that was easier to trace than the other two. He was born on December 17, 1760 and enlisted in the army in Massachusetts in 1777. Ephriam was captured by the British forces and taken prisoner in June of 1779. 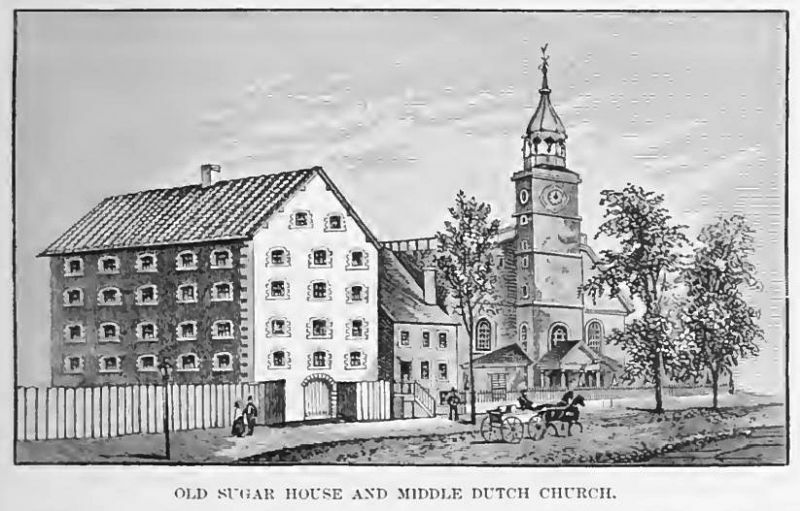 He was sent to New York and held in an old sugar house until 1780. An article written by Brooklyn College Professor Edwin Burrows, “The Prisoners of New York,” offers a glimpse into the conditions that Ephriam would have suffered as a prisoner of this war. According to Burrows, the Tories would line the streets as the prisoners were marched to these sugar houses. The crowd would yell and throw stones at the men as they shuffled toward their fate. The prisons were dark, airless quarters and the men who numbered between 4-500, were forced to face conditions that were described as horrendous. There was little space, no adequate clothing, and very little food. Disease ran rampant and as many as eighteen thousand men died in these prison camps. It was a miracle that young Ephriam survived. Ephriam was freed during a prisoner exchange and returned to his service. In 1780, he was given the task of guarding the infamous Major Andre during his confinement. Major Andre was a British officer in charge of the Secret Service. He conspired with Benedict Arnold, was captured and held prisoner in Tappan, New York. Major Andre was actually admired by the members of the Continental Army and became friends with many of his captors. Andre showed great courage when he was hanged on October 2, 1780. The executioner was preparing Andre by placing the blindfold over Andre’s eyes and the noose around his neck when he faltered and could not continue. Andre bravely placed the noose around his own neck. This act gained him the respect of every man gathered to watch the execution. After the war, Ephriam married Margaret Force in 1786. The couple settled in the east and had three children. Margaret died in 1809 and Ephriam moved his family west finally settling in Harlem, Illinois. He was 92 when he died in 1852 and was buried in the Kishwaukee Cemetery. All three men’s graves have been remembered for their service to our country with assistance from the Daughters of the American Revolution. It is a humbling experience to visit their graves and remember these men who were mere boys when they picked up their guns and joined the fight for our independence.